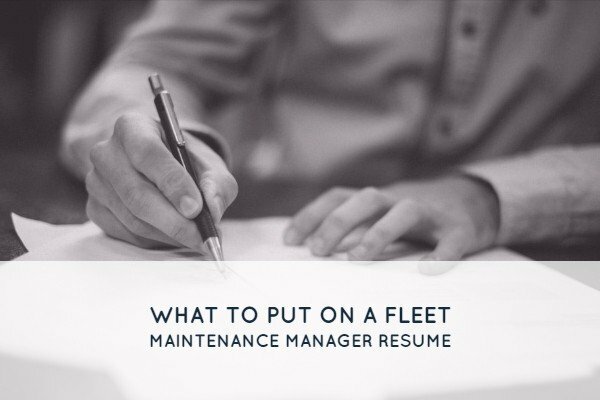 What Should You Put on a Fleet Maintenance Manager Resume? Fleet maintenance managers will always be in demand for growing business fleets. After all, as fleets grow, businesses need superstars to organize and maintain their expanding resource. So, here’s the question. If you are looking to be one of those superstars, what are some things to include on your fleet maintenance manager resume? We took samples of several resumes to profile a top-tier fleet maintenance manager resume. Generally, strong resumes had relevant maintenance management experience. In addition, candidates briefly described their job roles and bullet pointed job accomplishments. What are some of the most useful accomplishments? According to the samples, strong candidates should highlight the following skills and experiences. Organization tops the list because maintenance managers are expected to manage a lot of resources. In fact, fleets that hire maintenance managers tend to have at least 30 vehicles. In turn, candidates must demonstrate their process design and process execution experience on their fleet maintenance manager resume. For instance, one candidate mentioned that they devised schedules, tracked parts, and recorded costs which led to a 100% inspection pass rate. A strong resume should also highlight strong quality control. Why? A lot of maintenance managers have strong technical maintenance skills. However, maintenance managers don’t typically do frontline work. Instead, they are responsible for overseeing other people’s work. As a result, maintenance managers need to be quality control experts rather than mechanic experts. To illustrate quality control, a particularly strong resume should highlight metric monitoring experience. For instance, one candidate’s profile noted that they analysed KPIs and implemented best practices to improve KPIs. In turn, their vehicle compliance rates improved from 70% to 99%. Although maintenance managers should be quality control experts, they should also have strong technical expertise. Maintenance managers are expected to know vehicles and maintenance inside-out. This allows them to have intelligent conversations with vendors and staff members. What’s the best way to highlight technical expertise? A great technique is summarizing technical jobs such as mechanic work. While it’s not maintenance management experience, it’s still relevant experience. In fact, according to our resume sample, most candidates spent around 20% of their career in maintenance management. They spent the other 80% in support or frontline roles. Supplier management is another common task because the maintenance department regularly order inventory and parts. What is successful vendor management? As noted in a recent blog, successful vendor management involves creating long-term value rather than just finding the lowest cost. For example, an effective resume accomplishment stated that they “collaborated with a supplier to assess performance and ultimately satisfy end customers”. This is a powerful statement for two reasons. First, by using the word “collaborate”, the candidate demonstrates that they work closely with suppliers and are likely skilled in developing relationships. Second, the candidate shows that they ensured strong supplier service by prioritizing value. Lastly, budget management is a big job competency. As mentioned, maintenance departments regularly incur costs because they work with suppliers and account for emergency repairs. Strong fleet maintenance manager candidates should demonstrate savvy financial management. The best way to demonstrate financial management competency on a resume is to use numerical facts. For instance, many strong maintenance manager resumes provided numerical values for budget size or compared budget with spending. Was our article helpful? Feel free to share other suggestions on writing an effective fleet maintenance manager resume.